My good friend, Howie Balaban, loaned me this book, and it took a long time for me to get to it. For some reason I kept putting it off. I had already read Ready Player One by the same author, so I knew how good the books could be. Plus, Howie had been raving about it for some time. I can’t explain why I delayed picking up this book, but it was a mistake. Once I started Armada by Ernest Cline, I could not put it down. Imagine that all those role playing games you play on the internet are really more than just games? What if there’s a sinister reason behind the sudden popularity of these games and you’re the next guinea pig? Teenager, Zack Lightman, is one of those players and his life is about to change. Everything he thinks he knows suddenly makes no sense. Lightman is a troubled youth who lives with his widowed mother. He finds more security in the anonymous role-playing internet games than he does with most of his peers. So, when an opportunity arises, he finds that he cannot resist and he jumps at the chance. Not that he has much choice. What follows is an exciting science fiction story that, for Zack, feels stranger than fiction, yet oddly familiar. The plot of this story moves quickly from unrealistic scenario to unrealistic scenario but in a very fun and captivating way. Lightman is the unlikeliest of heroes, and he unwittingly tries to undermine his own success at every chance. He does the same with a prospective love interest. In the end, everything comes together in a perfect maelstrom of chaos, mayhem, and victory. I liked this book because it paid homage to all those late night sci-fi shows on UHF. I used to love those flickering, black and white movies where you could see the strings, the cameramen get in the way, and zippers on the alien costumes. This book is the best of those movies, all tied together with a Star Trek-ian and The Last Starfighter bow. For a science fiction fan, who could ask for more? This book is what we wanted our childhood to be. We wanted to be the heroes. We wanted to get the beautiful girl. And we wanted our strengths to be from those “damn video games” that our parents warned us about. You know that Ernest Cline was just like us. That he wrote two successful novels gives us justification for all that time spent battling electronic enemies. Ernest Cline has two novels, both of which will be made into movies. Ready Player One will be made into a movie that will be released in early 2018. 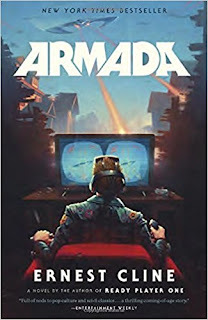 This novel, Armada, has been optioned for a film as well. If that doesn’t show you the success of Cline’s writing, I’m not sure what will. Readers, you will want to read these books in anticipation of the movies. This book will give you flashbacks to the 1980s. And that’s a good thing. No, it’s a great thing. Craig Bacon is all about nostalgia, and this book is full of it. He once wrote a 30-minute skit that he recorded on a tape recorder about fighting aliens. Someday, he will post it for some laughs. He was only 13 when he performed all the parts.